Alexander Gromow at Bad Camberg. 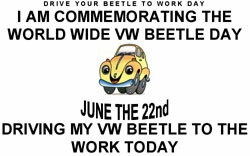 The World-wide day of the VW Beetle was resulted of an arduous work that took some years and that involved clubs of many parts of the world. Alexander Gromow had the idea and worked aiming the goal to launch it internationally. By mean of letters, the Internet was not accessible for the public in that time, as through the informative bulletin of the Fusca Clube do Brasil (Called "A BANANINHA" - the nickname of the directional semaphores of the older VW Types) he divulged the idea and harmonized the choice of the date. The date 22 of June finally prevailed; due to the fact that back in this date in 1934 a contract that gave beginning to the development of the VW Beetle by Ferdinand Porsche was signed. Details can be seen in the Declaration of Bad Camberg, which was authenticated with the signatures of the Dr. Bernd Wiersch, custodian of the Auto Museum Volkswagen, Mr. Heinz Willy Lottermann, great old collector of VW cars and promoter of the events of Bad Camberg (deceased in 2000) and by Alexander Gromow himself as creator of the idea of this commemorative day. The Declaration of Bad Camberg was distributed on June, the 24th,1995, in three languages to the attendants of this important event that had come of the five continents. Today this declaration is shown in many Sites of the Internet, having been translated to many languages, including:French, Greek,Japanese, Chinese. For this purpose a sign in A4 format in the position landscape was prepared so that it may be divulged between the Beetlemaniacs to be placed in the back lateral windows commemorating this great day! It is enough to download the Word archive and to print two copies. With a little of adhesive tape the VW Beetle will be duly will be identified as being part of this global group of sympathizers of this beloved car. Site prepared by Alexander Gromow former president of the Fusca Clube do Brasil. 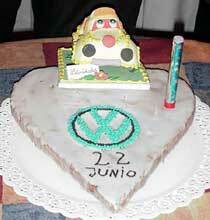 AVC-Argentina VW Club commemorative cake. 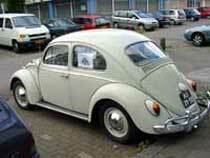 VW Beetle with a sign - Holland.